Peacock Jewellery: Since prehistoric times, men and women have worn jewelry made from stones, carved wood, shells, and beads. These materials were readily available in the physical environment. Ans its uses to create rustic yet beautiful adornments. Even today, Jewellery designers draw inspiration from the natural surroundings to craft unique and attractive ornaments for a regal and enchanting feel. Resembling the outer part of a bird’s wing, the beautiful and enchanting “Peacock Pinion Necklace” is a rare and exquisite necklace design that is engraved with diamonds and emeralds. The regal demeanour of the necklace is evident from the attention to detail that the designer has paid. 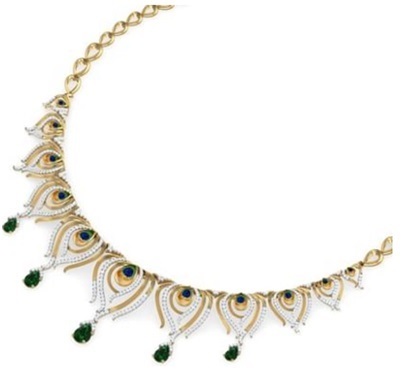 Whether it’s the colourful hues and impression of the peacock feather or the narrowing down of the leaf drops the necklace retreats to the corner, resembling a perfect crescent. From Sonam Kapoor to international celebrities like Ashley Tisdale, many have been spotted wearing ear cuffs looking fab and fantastic as ever. 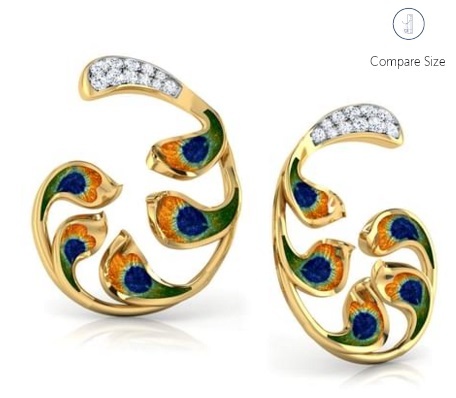 For fashionistas who strive to pose an edgy look, the “Enchanted Peacock Ear Cuffs” is just what they need. The bold design depicting the beautiful shades of a peacock’s feather and the subtle use of diamonds make this ear cuff and unique value to everyone’s jewelry collection. Bold rings are statement pieces that can enhance the style quotient or appeal of any look. “Peacock Feather Ring” from the Peacock Collection available at CaratLane is a unique and beautiful piece of jewellery. Which may be pulled off with a lot of panache. 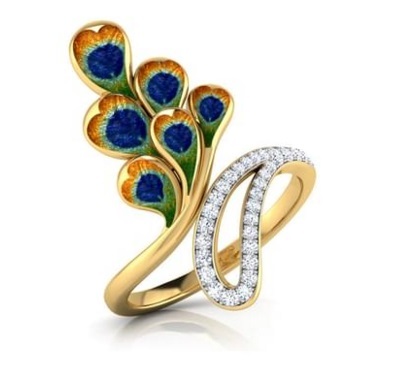 Again, the amalgamation of colours of nature and the excellent use of diamonds make this beautiful ring unique. To complete a regal look, a pair of earring that has a unique design, disposition and contour is a must. 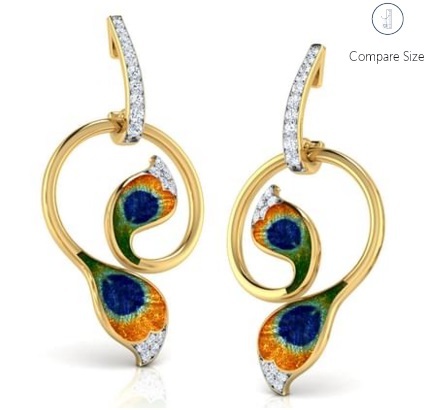 The “Plumes Peacock Hoop Earrings” is an extraordinary jewellery that depicts the feathers of a peacock. The paisley design that carries the beautiful shades of turquoise, rust and green is ever more beautiful and enchanting. The hoop design of the earring is very snug and it can fit comfortable. Devoid of any ostentatious character, that one is a perfect pendant. The ornament can be worn on any occasion or with any outfit. 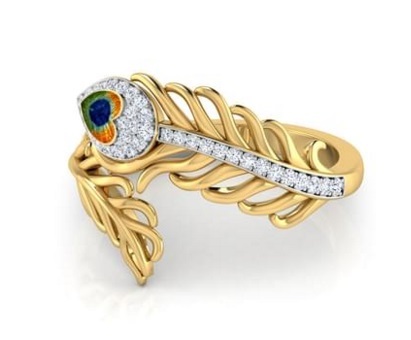 For those who love to collect jewellery showcasing one of a kind design and impression the “Crown Peacock Rings” is what they need. The six paisley designs resembling the open feathers of a peacock and an array of diamonds neatly arranged around the rim are both unique and beautiful. A delightful addition to anyone’s jewellery collection, this lovely and alluring ring can transform the look and appeal of any attire or style. 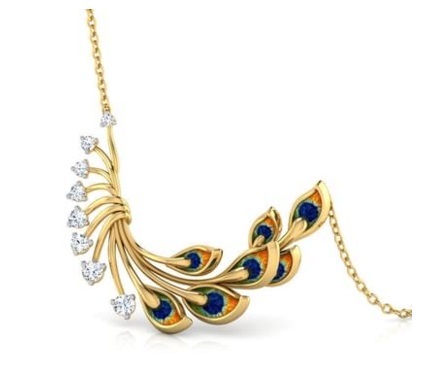 The “Royalty Peacock Necklace” is an adorable and exquisite piece that portrays the beautiful lashing feathers of a peacock. Attached to a very delicate gold chain this pendant styled necklace has a unique quotient attached to it. The smart use of diamond is yet another high point of this beautifully crafted necklace design. This Peacock collection is the tribute to the natural world. Engraved with the most precious stones and elaborated with beautiful and unique hues of colour. Portraying the attributes of our natural setting, the collection is truly inspirational and spellbinding. Each motif or design is nothing short of fantasy and bliss which every jewellery lover shall appreciate. The Peacock collection, for instance, is a profound example of how nature can inspire the creation. The creation of a beautiful line of necklace designs, pendants, rings, and earrings. So, if you prefer ornaments and embellishments that have roots in the wilderness. CaratLane brings to you, an elegant and exquisite range of jewellery from the collection that is breathtaking and gorgeous.